5th grade students working together to write in the notes of each song. I grew up playing video games, maybe too many if you ask my parents. Looking back, I should have picked up an instrument sooner instead of playing all those games. There is a positive side, though, because my favorite gaming series, The Legend of Zelda, has taught me problem solving, how to read, and a love for music. The music featured in the series is some of the best in video gaming. There are several Zelda games that feature an instrument such as Ocarina of Time and Majora’s Mask. The main character in the games has to play very simple songs in order to galavant around the land and save the world. One of the things they stress in the Teacher Education program at Pepperdine is that you need to “spice up” the lessons, which means incorporating my love for Zelda in my music classes. 4th Grade students playing a song from the Zelda franchise. In our music classes we have been learning how to read the treble clef. I’m teaching classic acronyms such as FACE for the spaces and EGBDF (Every Good Boy Does Fine) for the lines. Once I felt that the students had a good grasp of these concepts, I figured that they needed to see the notes in action. They needed to play something, to experience music coming to life. I was lucky to have two sets of bells donated to me before coming down to Huehuetenango. Naturally, I want the students to get good use out of the bells, and I thought that a simple way to ease them into it would be to teach them Zelda songs. Zelda melodies are straightforward and catchy. You hear it once and it is stuck in your head. Some of the songs are comparable in difficulty to other child classics, such as “hot cross buns.” The songs’ simplicity made them ideal for this lesson. A 6th Grade student having some fun writing. I took the time to write down two of the melodies from the games. 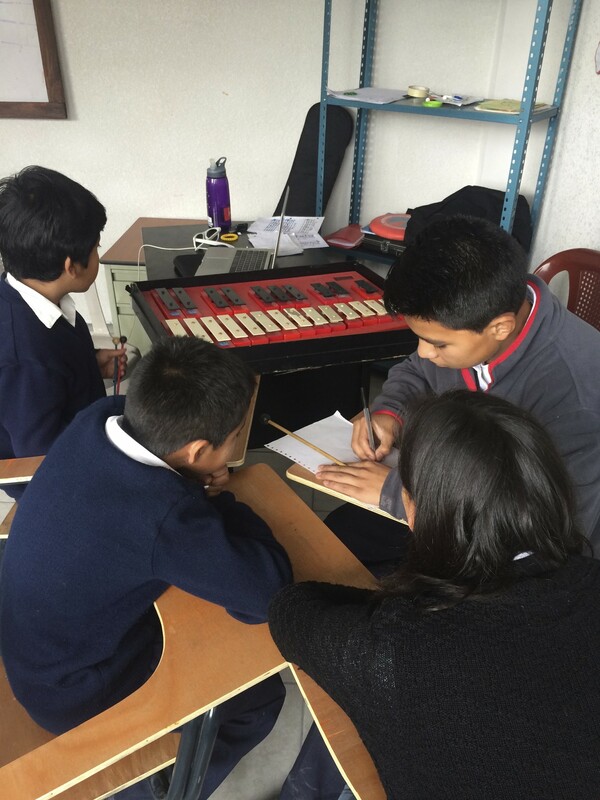 Then I had the students split into small groups of about two or three students and write out the rhythms and the names of the notes, reviewing everything we had done so far in the class. When the groups were ready, I showed them the bells. They seemed to be excited because they have not had anything like them in the music classes in the past. I gave them some time to play with the instrument and then asked them to try and play the song. I am happy to report that it went smoothly. Once they mastered the two songs I notated from the Zelda franchise, I saw and heard the students starting to create their own songs, witnessing the creative process before my eyes. This is only the beginning though. Soon my students will be playing many simple songs with the bells in order to get more practice. I am excited to see where the bells and this new found creative freedom takes the class. If all goes as planned, most of my students will have their own original songs before the first bimester ends! In the next bimester we will be playing the recorders! Today I realized that it has been a month of school and I have not posted anything about the PE classes. Sad right? Well today we will be discussing some of the things I have done with my first and second graders. As stated in a previous post, I have had some challenging times with my first and second graders, most of which had to do with the lack of an established structure or routine in my PE classes. After much experimenting in my first and second grade classes, I finally had an idea. I simply asked myself, if I were a child, what would I want in a PE class? The answer was simple: competition. I split my first and second grade classes into two teams and tasked them to create their own English team names. For example, the second grade teams are the Dolphins and the Turtles (they were studying ocean life recently). With this structure in place, I am able to give points to the teams in a positive manner, such as not interrupting in class or staying on task. So far, these classes have been a blast thanks to the team-based structure that plays into the students’ natural competitive drive. My students love to run, so I try to find activities that incorporate that love while assisting their English development as well as teaching them to work as a team. The first activity we have been doing is simple: running relay races. Kids will run on tires, dance for three seconds and scale the playset all while holding a volleyball. The catch is that the team only wins if they are in line and silent. They cannot be talking. There have been many races that the team who was behind during the race will win because they were the first team to have all their players run and wait quietly in line. It’s fun the watch the kids slowly realize that they race is about participation and following directions rather than just being the first one to finish. Some of the cards that I hang around school that the students have to find. The second activity involves vocabulary. I usually ask the first and second grade teachers what words they have been working on. Once they send me a list, I make flashcards and tape the cards around the school. The task is to run to the card that I said and get in line with the team. The first team to have all of the players in line quietly wins a point. This once again builds teamwork because the kids are figuring out the vocabulary together and then running to the desired destination. It’s amazing to see ELL students go through the process of working together to find the word and then have that “lightbulb moment” when they find it. Overall, PE has been an adventure to teach. These past few months have been about trying to figure out what works and doesn’t work in each grade. It is refreshing to finally have found something that will work for the younger grades. In music class yesterday, my fourth graders had the opportunity to Facetime my former master teacher, Clark Barnett, and his fourth grade class. Before coming to Guatemala, I spent four months learning the ways of teaching under Clark’s guidance as well as teaching his wonderful students. For me, it was a great opportunity to connect my former students to my current students! Now, what does this have to do with music? Well, I have to tell you a little about my elementary music experience in order for you to understand the whole picture. Back when I was in fourth grade at Edison Elementary, I had a music teacher named Mrs. Krisberg. We did all different activities in class, but there are two activities that, to this day, stand out to me: learning the recorder and singing the “goodbye song.” She ended all of her music periods with the goodbye song, and more than a decade later, I still have the tune memorized. When brainstorming a good first week of school activity for all grades, I immediately thought of that song. So, I wrote lyrics for a hello version of the song as well as the goodbye version and taped it up on the classroom wall. Since all of my students are learning english, I thought this would be a good way to introduce words, such as “hello,” “goodbye,” “welcome,” and phrases like “thank you.” Teaching the song during the first week went very well. The younger grades want to sing it every time we have a music class. It’s so fun! So, when thinking of a simple activity that would translate well over Facetime, I once again thought of that song, but this time teaching it in Spanish to my former students. My current fourth graders and I translated the English version to Spanish. We printed off little half sheets, and sang it for my former fourth grade students back in the United States. Below are the lyrics to the goodbye song in both English and Spanish. Overall, I think my students enjoyed the time. Both my current and former students were exposed to a new language and a new culture through using technology. I think the opportunity to Facetime with another class was a captivating new experience for the students. My former students had the same opportunity that my current students had during the first week of school: learning a song in their second language. From what I hear, my former students will be writing letters to my fourth grade class. I am excited for the letters to get here and for both my current and former students to get to know one another! In music class with grades 3-6, we have been doing a lot of rhythm games! They are able to identify quarter notes, half notes, 8th notes, whole notes, and now 16th notes. We practiced them through repetition games as well as through competition. Once I felt that the students had a grasp of the rhythmic notations, I introduced the cup game to the students. They loved it! I even showed the music video by Anna Kendrick as well as a cover of the song by Sam Tsui. Once they saw the videos they were eager to learn the game! Teaching the game was a slow process. Since I only have forty minut e periods, I decided to split the learning into two separate class periods. I must say that the kids really started to learn it on their own. When I visited the orphanage, which is where the majority of my students live, they were practicing after they ate dinner. It was such a wonderful sight. The students who practiced outside of the class became the leaders inside the classroom. Right now, I am very optimistic about the direction all of my classes are taking. Leaders are starting to take charge in most grades, students seem to like my class, and there is a lot of active participation. It makes me pretty excited for what we can accomplish. I look forward to seeing how these students grow this year!